Palm was under serious pressure to hit a home run at CES today—and boy, did it deliver. Running Palm's gorgeous (if belated) new platform, dubbed WebOS, the touchscreen Pre could well be Palm's savior, and perhaps its biggest hit.So, as for the Pre itself (due on Sprint in the first half of this year, no pricing yet): It's got a big, 3.1-inch 480 by 320 touch display (yes, with multitouch and an accelerometer), weighs in at 4.8 ounces, and comes with a curved, slide-out keypad. Yes, it does Wi-Fi and 3G (EV-DO Rev. A, to be exact), as well as GPS (with turn-by-turn directions courtesy of TeleNav), stereo Bluetooth, 8GB of internal storage, a 3MP camera, a 3.5mm headset jack, and a removable battery.But the key to the Pre is its OS, and WebOS—previously code-named "Nova"—is one of the hottest mobile platforms I've seen yet, rivaling both Android and Apple's iPhone OS.At a glance, WebOS doesn't look all that different from the icon-driven, touch-based Android and iPhone platforms; you've got your main, wallpapered home screen, complete with a row of icons along the bottom for your standard e-mail, calendar, and calling features.But Palm's done a few key things differently here, starting with the "gesture" area at the bottom or side of the screen (if you're, say, surfing the Web in landscape mode). For example, if you're browsing an individual contact in the Pre's address book, you can flick horizontally in the gesture area to go back to the contact list, or you can flick up for a translucent window shade of applications. Nice.More importantly, though, is WebOS's way of letting you handle and sort all your open applications like a deck of cards. If you're composing an e-mail, for example, you can flick up, call open a new application, and then return to your e-mail at any point. All open applications appear as windows (similar to the windows in the iPhone's Web browser), and you can flick back and forth, reorder them, and discard them at will. That's really cool, and it solves one of the biggest problems that's dogged the iPhone—namely, that its various applications are all walled off, making it difficult to easily switch from, say, the Web browser to the calendar and back again. 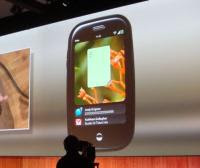 WebOS also introduces a concept dubbed "Synergy," which all applications can continuously get info from the Web. The best example: WebOS's unified contact list, which seamlessly displays all your contacts and grab their e-mail addresses, phone numbers, and IM handles from Facebook, Gmail, Exchange, you name it. I'm also happy with Palm's integrated messaging interface, which combines IM and text chats into a single, threaded conversation.And then there's the WebOS "Dashboard": a flexible space at the bottom of the screen for calling, messaging, and appointment alerts. As you're working in other applications, you might see the first line of a text message or IM, or the Dashboard might open a bit bigger for a calendar alert, complete with "dismiss" and "snooze" options. When alerts appear, you're free to keep working in your open application, or you can go ahead and open the alert—and if you want to answer an IM, you can swipe to that "card" in WebOS, and then return to your previous application card. Great stuff.A few other interesting notes: When you're sitting at the Pre's main screen, you can just start typing on the QWERTY keypad to call up a universal search menu; you'll instantly see any matching contacts, or you can quickly jump to Web results from Google, Google Maps, and Wikipedia.Oh, and I almost forgot to mention "Touchstone," a little hockey puck of an accessory with a killer feature—wireless charging. Just place the Pre on top of the Touchstone device to power it up. Awesome.It's a lot to chew on—indeed, Palm's press conference is barely an hour old, and already I'm having the same feeling I did after the iPhone's debut two years ago. The Pre—and WebOS—look red-hot, and the two combined may well guarantee that Palm will live to fight another (and perhaps, many) days.So, initial thoughts? Like what you see? Will developers take to writing WebOS applications? Fire away.